1 Comment on Anime Review: Baccano! Based on the Japanese light novel series by Ryohgo Narita, Baccano! is a mind-melting adventure set in the Prohibition-era United States. It focuses on eighteen characters across a time frame of over three years who share only one thing: immortality. While the characters cover an astounding variety – they include a sister looking for her missing brother, a youngster just initiated into the mafia-esque Camorra, a duo of eccentric thieves and a Railroad Monster – this anime does a brilliant job of combining their individual stories into an overarching and related tale. But Baccano! is not what its story is as much as how it tells this story. Switching rapidly between different times and characters, often without any warning, it successfully toes the fine line between confusing the audience and keeping their interest. Baccano! juggles its extended cast perfectly to tell different stories and, more commonly, the same story from different perspectives. The non-linear yet seamless unfolding of the plot leaves the (initially flabbergasted) audience satisfied in a way that is difficult to replicate in a regular, single-thread narration. This endeavour is helped enormously by the show’s endlessly interesting characters, who come in various shapes, sizes and personal agendas. Some delightful, some whimsical and some plain disturbing, all the characters are memorable and seem to drive the story rather just be a part of it. The anime carefully avoids assigning the protagonist status to any of them and instead chooses to give them a touch-and-go treatment. Even so, while this works perfectly for most of them – enough to pique curiosity and extract interesting perspectives but not enough to be redundant or nitpicked on – some of them would have benefitted from more screen time. For a chronicle that concerns itself with immortality, Baccano! abandons the associated tropes (be careful for what you wish for, who wants to live forever, etc.) with as much energy as it does traditional storytelling. By inserting the paranormal into the human realm, we get instead the message Life is Good, hidden beneath centuries upon centuries of ambitions, scheming, torture and murder. This story may be a disappointment to a viewer with more conventional tastes, as it has no sort of nexus or closure at its end. But the anime remains exceptional in accomplishing what it sets out to do: to tell an amusing tale of cults, terrorists, the mafia and several misunderstood psychopaths that is generally way beyond the scope of a typical sixteen-episode series. What’s more, the show delivers its substance with style, packing in snazzy music, stellar animation, catchy and unique episode titles, and occasional meta-commentary. 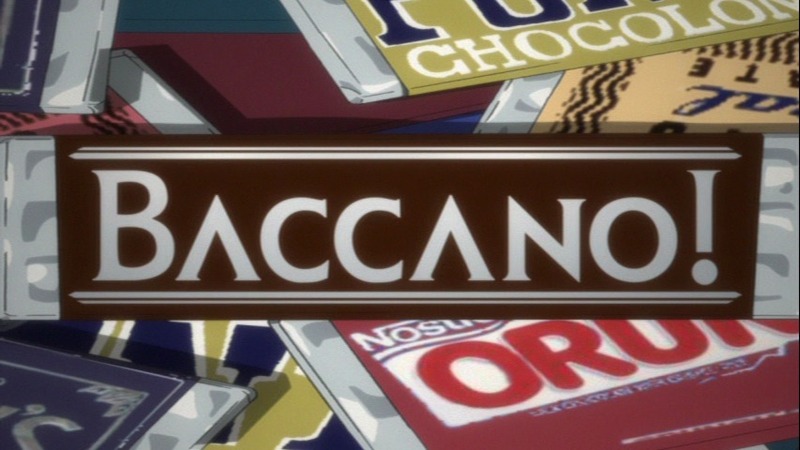 If you are prepared to be confused, disoriented and surprised, Baccano! is a rewarding experience both in its story and storytelling, even more so on a rewatch. Just remember that the story is almost never going where you guess it might be. That is, if you can even take a guess. Baccano! ran for sixteen episodes in 2007, and is now available with both English subtitles and an English vocal dub. The characters are amazingly fun to watch bounce of each other. Insane people are set up, and the pay-off is amazing when they meet up. The music is the exact same way, and the opening is the best I’ve ever seen, ever. I like this anime. Next Entry Movie Review: Salaam Bombay!